The other day I did a little research on how to find funding for a new wool product. One option I looked into was the crowdfunding platform Kickstarter. I wanted to better understand if this could be an avenue for wool products to raise funding. I took a particular interest in the wool products that launched a campaign on Kickstarter and how they performed. This is what I found out. In summer 2017, there were a total of 183 wool projects launched on Kickstarter of which 42% reached their funding goal or exceeded it. Interestingly this is a higher success rate than the average of 35% on Kickstarter. On the flip side, it is also important to note that a total of 107 projects failed to reach their funding goal. Kickstarter rules are all or nothing – if you don’t reach your funding goal you are left empty handed even though you might have raised 70% of your goal. I also had a closer look at the top 20 projects with the highest funding and the highest number of backers. Interestingly there were a total of 7 wool shoes or wool slippers among the top 20 projects of which 5 even ranked among the top 10. Among the campaigns were also two brands who launched 2 or even 3 consecutive campaigns successfully. All of these 5 campaigns ranked among top 20 as well. This indicates that these brands have successfully connected with their audience and customer base on social media and were able to activate them for their cause during the campaign. The average amount backers pledge on Kickstarter is US$ 25. The average amount of pledges backers made for the top 20 wool campaigns was US$ 111. This can be easily explained that wool products tend to be higher in price, therefore backers who bought a pair of wool sneakers or a wool shirt would have already paid a higher amount. Kickstarter is a US based company, which explains why the majority of Kickstarter campaigns, as well as pledges, are based out of the US. Among the top 20 wool campaigns launched, 9 campaigns were US based, 6 based out of Europe, 2 out of Canada and the rest out of New Zealand, Peru and Ukraine. This is something to consider in regards to your target audience and shipping of your final product. It almost seems that wool is the key success factor when it comes to raising funding on Kickstarter. However, when comparing successful wool campaigns with unsuccessful ones a different picture appears. Brands who focused on the advantages of wool and how wool was a great fibre did not do as well compared to the brands who focused on the consumer experience. The key to success lies in focussing on the consumer and explaining how the consumer will benefit from the product. 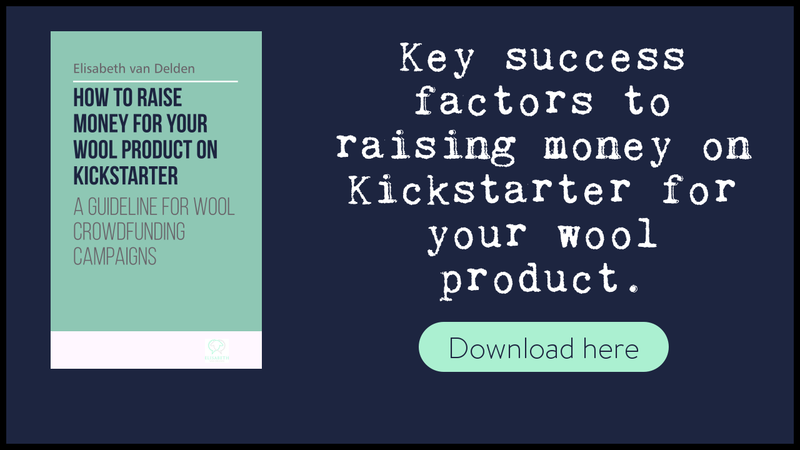 If you are interested in digging deeper into Kickstarter then you can download the report I wrote on how to succeed with your wool product on Kickstarter. Download the full report here or click on the image below.